America has spent the last seven or so decades shaping the rest of the world in the neoliberal pro-market, anti-people mold. An important component of that global plan is the Middle East, where Israel provides a foothold for Western interests in a region where the West is traditionally unwelcome. Every so often, Israel decides to launch missiles or drive bulldozers – generously provided by the U.S. government and corporations like Caterpillar – over the already brutalized Palestinians living next door in Gaza or the West Bank. In the media, images of these atrocities are cleansed and contextualized to fit with the established U.S. narrative of Israel as a vital U.S. ally that’s perpetually under attack. This is true from the most liberal rags to the most vicious of conservative radio. 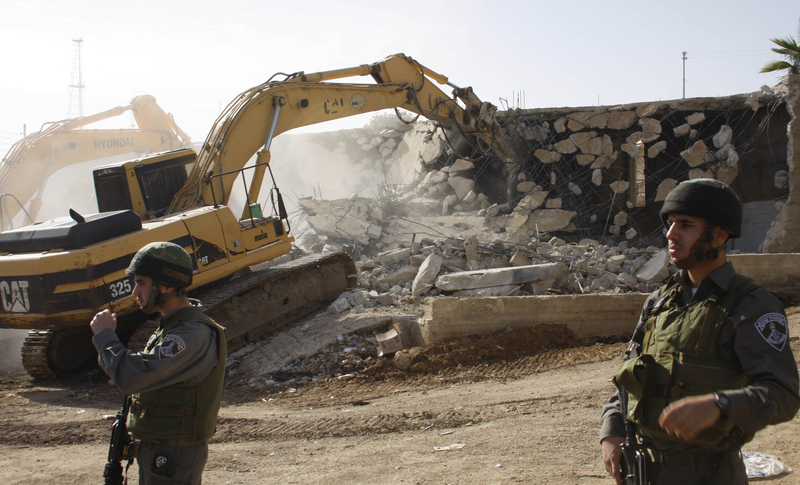 A Caterpillar bulldozer razes a Palestinian building in the West Bank. Photos of dead Palestinian children can’t help but call that narrative into question, though, and need to be explained away. Never short on perverse rationale, mainstream commentators have the answer: Hamas, the main political element in Gaza, wants those dead kids just so they can show the world how bad Israel is. Naughty them; they think they can win hearts and minds and seem like the victims just because there are mounds of dead Palestinians to point to. Thane Rosenbaum’s July 21 column in the Wall Street Journal arguing just that is one of the most revolting pieces of propaganda composed in recent memory, an acrobatic display of subservience to official doctrine. Work your way through this logic: it isn’t Israeli terror that has U.S. commentators concerned, but rather Hamas highlighting its devastating human toll. Curiously, this fits an oft-repeated propaganda method, as illuminated by Glenn Greenwald at The Intercept. Israeli President Benjamin Netenyahu sounds little different talking about Palestinians than Joseph Goebbels did talking about German Jews. Strange bedfellows, indeed. Further critiques of Hamas call them out for having the audacity to fight a guerrilla war among schools and businesses in the streets of Gaza. They wear plain clothes, making it difficult for Israel to distinguish soldiers from civilians and leaving them no choice but to just wipe everybody out. Never mind that it’s Israeli expansion and aggression bringing war to Palestinians’ doorsteps: how dare Hamas fight back where children could be hurt? 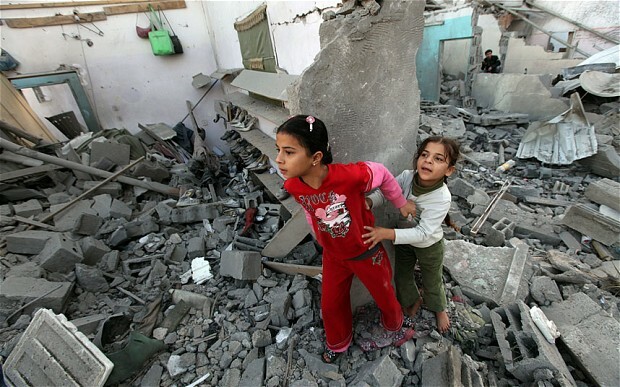 Playtime in Gaza. It’s a safe bet that they aren’t worried about asbestos. Of course, only from the cozy confines of a U.S. office could this ongoing tragedy be regarded as a “war of perception.” It’s a real war, with an invading force bombing the hell out of soldiers and civilians alike and slaughtering with total abandon, as in the case of the Palestinian man put down by an Israeli sniper while searching for his family amid smoldering rubble. 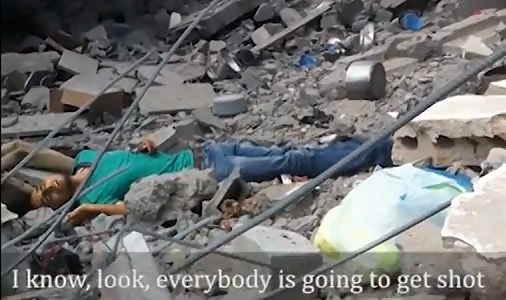 A YouTube screen cap of a man shot by an Israeli sniper while hunting through rubble for his family. In war, it is often difficult to distinguish the good guys from the bad, but the U.S. media doesn’t even try. Regardless of the crimes alleged against Hamas, the numbers alone make a compelling case that we’ve got right and wrong jumbled: 500 dead Palestinian civilians and thousands of others wounded against two dead Israeli civilians since the conflict exploded. Israel has been expanding violently into Palestinian territory in violation of international law for decades, and conventional wisdom usually holds that people defending their homes from invasion are morally in the right. But commentators are eager to make exceptions for the U.S. and its allies who, as Noam Chomsky notes, own the world and can therefore never be regarded as the invader. War is an inhuman and immoral endeavor; it can only have inhuman and immoral justifications. The media employs some of the most latitudinous abuses of logic in pursuit of that justification, which offers some insight – if viewed properly – into the outright psychopathy of war and its attendant propaganda. America’s media is famously awful, but on almost no story is it ever worse than on Israel-Palestine.